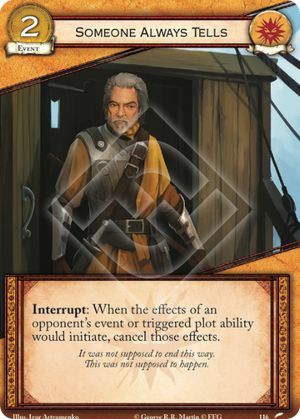 Interrupt: When the effects of an opponent’s event or triggered plot ability would initiate, cancel those effects. It was not supposed to end this way. This was not supposed to happen. Want to build a deck using this card? Check out the A Game of Thrones 2nd Edition Deck Builder! if you have the gold when it's needed, can you cancel Valar Morg from going off with this?